Christmas At Your House In Plano This Year? How Does Your Carpets Look? Is Christmas at your house in Plano this year? A house full of relatives all there to celebrate the Christmas cheer, open presents, and of course enjoy that wonderful Christmas dinner. Even though we all know our relatives. Some are visiting every few days and some we don’t see for months or even years at a time. So first impressions really do matter. Even though, everyone is coming to celebrate. One of the first things we all notice besides the presents under the tree is the carpets and floors in the home we are visiting. Do you really want you friends, relatives and neighbors to be confronted with filthy carpets when they visit your home? Of course not – but if only that was your only worry! What about the family? Depending on their age, your children will tend to spend a lot of time down at ground level playing and opening presents. Do you want them to be crawling around in dirt off the street? Of course you don’t! A professional deep cleaning of your home not only restores the look of your carpets. A professional cleaning also removes the dust mites that trigger allergies, bacteria that cause diseases. While leaving your carpets looking amazing and ready for the kids to play on. Ultra Clean Floor Care can keep your family free of those illnesses that can be caused by dirty carpets. This is not scaremongering, it is proven fact, you already know that dirty carpets are not healthy. So why not have them looking amazing for relatives, friends, and especially the kids? There are so many different types of home carpet cleaning machines available for you to buy or rent. There is very little wrong with these, other than that they cannot clean as deeply as a professional carpet steam cleaning service can. Sure, they will maybe clean off the top layer of dirt. But, can not reach to where all the little nasty’s like to hangout. Ultra Clean Floor Care truck-mount units reach all the way back to the mat. We also have phenomenal dry times by taking extra dry stokes to ensure all that extra moisture is removed from the carpet. Depending on the package level chosen, we will even drop a drying fan to speed up the drying process. So don’t over wet your carpet with one of those do it your self home carpet cleaning machines. Leave it to the pros at Ultra Clean Floor Care. Our deep cleaning methods will get rid of all those unwanted household detritus, walked-in dirt, and allergens such as pollen, insect waste, and dust mites. Best part is our solutions are pet friendly and baby safe. Our high temperature steam and water cleaning kills the bugs and frees up the sticky fats and oils to be brought to the surface where they are immediately vacuumed up along with the bulk of the water from our truck-mounted units. High temperatures and high vacuums make for clean carpets that dry faster than if you used a normal home carpet cleaner. Not only that, but we professionals understand the conditions that your carpet can tolerate. They will not ruin it with too harsh cleaning conditions. Give us a call and let our IICRC Certified technicians can give you that Christmas carpet cleaning properly. You relax while we work to ensure your carpets are clean and restored to that like new condition, safe for the kids to play. Don’t forget to ask our technician about putting a protective finish on your carpets called “scotchgard”. By applying scotchgard to the carpets immediately after they are cleaned insures you are protected from all those accidental spills from the food and drinks. We love our relatives and kids, but when they all come together, accidents happens. Christmas at your house with clean carpets. 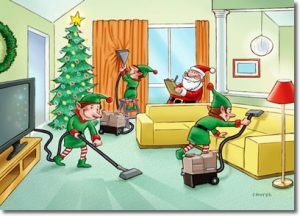 Merry Christmas from all of us at Ultra Clean Floor Care!